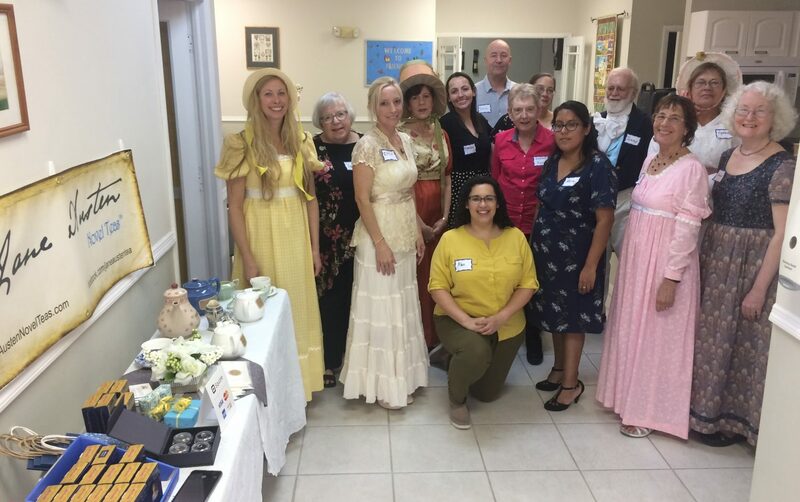 Everyone had a glorious time last Saturday, February 2nd, 2019 at our very first all-day Jane Austen event called Life of the Party in Regency England. 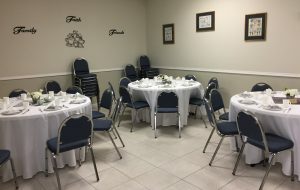 When guests walked into the main hall of the Friendship Grace Brethren Church, where the merriment was held, they were greeted with a Tea Table, Sign-in Table, which held our Formal Program of Events, and a most striking arrangement of tables all set up for our tea party, complete with coordinated centerpieces and luncheon-ware. Dancing, Tea, Fashion, and Quotes! The day was full of English Country Dancing, a presentation on fashion during the Regency Era, Northanger Abbey Readings, and of course, no Jane Austen event would be complete without plenty of tea. We were graced with a wonderful teacher to introduce English Country Dance to the majority of attendees. Elizabeth Freedman started the day out with a rousing lesson in ECD. What fun we had! The morning lesson was followed by a short break and then a discussion given by Elizabeth on ECD. She mentioned that there are probably thousands of dances and that she knows most of them. Another interesting fact in her talk was the fact the term English Country Dancing actually is from the term English Contra Dance. Our luncheon was a lovely tea party with the tea provided by member Anja Carlson and her line of teas called Jane Austen Novel Teas. We tasted three teas based on the Jane Austen novels: Sense and SensibiliTea, Donwell Abbey Strawberry, and Mansfield Mocha Tea. Anja gave us a brief description of her teas before we partook of them during our lunch. Everyone loved the teas and our luncheon food was delicious as well. Diners enjoyed three kinds of petite sandwiches, (crusts removed) which included, Chicken Salad, Tuna Salad, and Egg Salad. Fresh Fruit with a sweet dip and a vegetable tray and dip were also on the menu. Finally, some mini desert bars pleased our pallets and all the food was a great accompaniment to the teas. 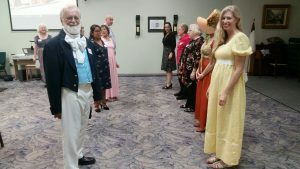 Florida Repertory Theatre in Fort Myers presented on the many different fashion trends during the Regency period from undergarments to fancy dress. Last summer Alex also came to two previous costume workshops to help members out with constructing their regency attire. Event Chairperson, Ann Hartley introducing Alex. 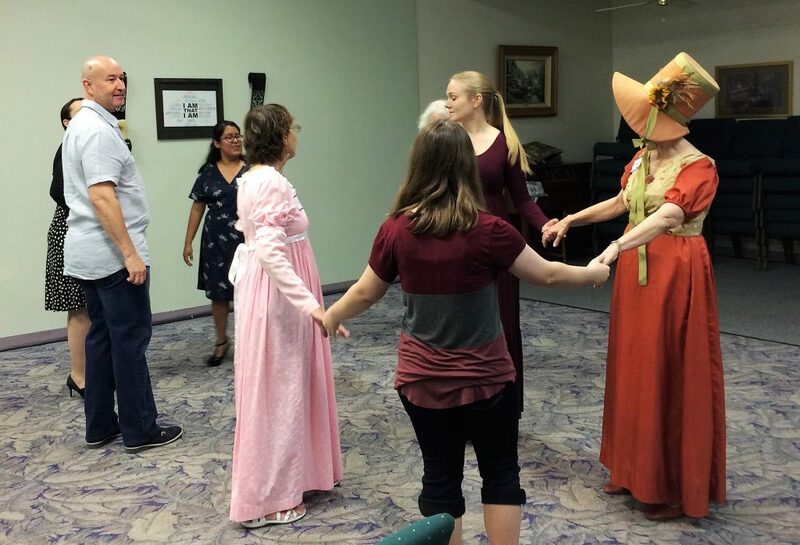 Charter JASNA SWFL member Nili Olay lead a reading of some fashion and dance scenes she selected from Northanger Abbey. Nili read the part of the Narrator while other members Anja, Ann, Cheryl, Jerry, and Sam all read various parts. Each reading was followed by Nili’s perspective on the scenario taking place in the scene. Nili is very proficient with Austen’s works and always adds a lot to our monthly discussions. After a short afternoon tea break, we concluded with a bash called Life of the Party Grand Ball. In reality, it was another lesson, but this time we were really getting the hang of it and truly enjoying ourselves as we danced as though we might have been at a true ball similar to those featured in Austen’s novels. Rave Reviews about the day! We received several emails with glowing feedback about this little shindig. “Thank you for a perfectly lovely day of Austen treats! The dance and costume presentations were informative and fun, and your program of quotes on dance and fashion from Northanger Abbey was spot on! The tea luncheon gave us a nice choice of foods and teas to sample, and lively conversation at our table. We would like to thank everyone who contributed to making this event such a rousing success. Thank you kindly to Ann Hartley, Jerry Vetowich, Nili Olay, Anja Carlson, and Laurie Nienhaus for their efforts in organizing. Thanks also to our speakers and sponsors, Elizabeth Freedman, Alex Vazquez, Nili Olay, Anja Carlson Designs, and Jane Austen Novel Teas. Looks like great fun! 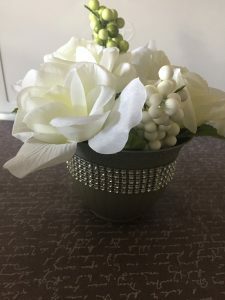 Beautiful table settings. Thanks, Anja, for the writeup and pictures. Oh, thank you so much, Betsy! I’m so glad you like the table settings! I appreciate the thank you for the write-up. David and I would like to thank everyone for the warm welcome we received from everyone. We had a great time and we both have decided to become members of JASNA. We’re looking forward to meeting all of you again! We were so thrilled to have you there Barbara! I was very happy to get to sit with you during the tea and visit. Thanks again for helping with the cleanup of all the teaware afterward especially. You guys are the best!